Organic, Patriotic, Delicious...Need I say More? Okay so you may remember that I posted the same easy peasy organic recipe last year but how could I not share it again this year with all of our new green friends? I ran across this yummy and easy Fourth of July treat in a Prevention magazine article last year on the importance of GMO labeling by super greenie and super mom, Robyn O'Brien. 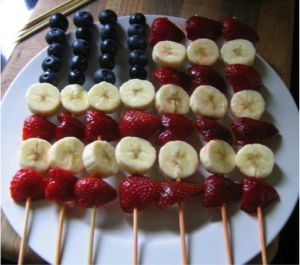 I think this flag kabob is the perfect organic dish for non foodies like myself to easily put together to impress the kids, friends and guests at this year's 4th of July celebration or bar-b-q. For an extra cool treat, I like to freeze them! It is so easy I don't think you need me to explain it right? I will say that the skewers are the ones you use to make kabobs and you can totally reuse them to be green (be sure to wash thoroughly) or use 12" Stainless Steel Oval Skewers. Just keep in mind when preparing for your Fourth of July celebratory treats that domestic blueberries and strawberries are on the Environmental Working Group's (EWG) Dirty Dozen list as one of the most exposed produce items in terms of pesticides. If you remember, last week I wrote about why going organic pays and now is the perfect time to time to make organic count. Pesticides have been linked to cancer, hormone disruption and birth defects so steer clear of those conventionally grown produce items, make it easy and just buy organic.